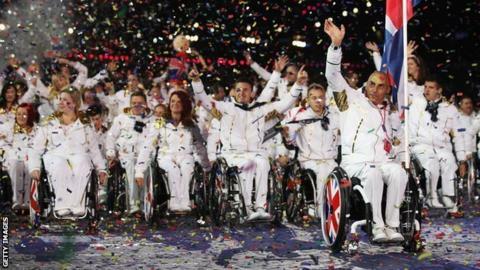 A sport-by-sport round-up of how ParalympicsGB athletes perform on Day One of the 2012 Paralympic Games in London. Kenny Allen leads the pack in the men's recurve standing event after producing a Paralympic record 651 points, Phil Bottomley came in third (630), but Murray Elliott struggle and is at the foot of the table with 542 points ahead of the elimination round. Paul Browne, who finished ninth in Beijing in 2008, opens with a total of 598 in the men's recurve W1/W2 event to leave him in ninth place going into elimination. Danielle Brown begins her defence of the women's compound with an opening total 676 to leave her in first place going into the elimination round on Friday. Mel Clarke finishes third with 650, while Pippa Britton is eighth on 641. John Cavanagh finishes his ranking round in the men's compound W1 in seventh place on 616 points going into elimination. Kate Murray finishes her ranking round in the women's individual recurve W1/W2 in eighth place with 533 points ahead of the elimation rounds. Sharon Vennard who finished sixth in last year's World Championships, opens with a total 549 in the women's individual recurve - standing which leaves her in sixth place going into elimination. SILVER MEDAL - Mark Colbourne wins silver in the men's individual 1km time trial (C1-2-3) in his debut Paralympics in a time of 1:08.471. Darren Kenny, who won four gold medals in Beijing, is pushed out to fourth place in a time of 1:10.203, while Ric Waddon finishes ninth (1:11.394). GOLD MEDAL - Sarah Storey successfully defends her women's individual pursuit C5 gold from Beijing after lapping Poland's Anna Harkowska half-way through the final race. Storey had earlier broken her own world record in qualifying (3:32.170). Crystal Lane completes her 3km heat in a time of 3:59.220 but then loses in the ride-off for the bronze medal. ParalympicsGB men's team lose their preliminary opener 11-1 to world champions and Beijing silver medallists Lithuania, whilst the women team suffer the same fate at the hands of China with a 7-1 defeat. Natasha Baker scores the top mark of 76.095% aboard Cabral as she makes her Greenwich Park debut in the dressage team test grade II event. The 22-year-old is only competing as an individual and will go for medals on Saturday and Monday. Lee Pearson scores the top mark of 74.682 on his horse Gentleman in the dressage mixed team test grade Ib event. BRONZE MEDAL - Ben Quilter, the current world and European champion, wins bronze after defeating Takaaki Hirai of Japan by ippon in the bronze medal contest. Earlier he defeated Ron Hawthorne of the United States, after he had won the first repechege by overcoming Mongolia's Mukhbat Aajim by ippon. BRONZE MEDAL - Zoe Newson takes bronze in the women's -40kg lifting 88kg, with Turkey's Nazmiye Muslu taking gold with a lift of 106kg. Anthony Peddle finishes in eighth place in the men's -48kg with a score of 140 which means he is eliminated. Di Coates, competing in a British record-equalling eighth Paralympics, finishes on 389 out of 400 (ninth) in the women's R2 10m air rifle standing SH1 event but it is not enough to reach the final, narrowly missing out by two points with only the top eight qualifying. Karen Butler (384) and Amanda Pankhurst (380) finish 12th and 16th respectively in the same event. Adrian Bunclark finishes in 30th place in the men's P1 10m air pistol standing SH1 event with 537 points and does not qualify for the final. ParalympicsGB men are defeated 25-14 25-18 25-20 by Beijing bronze medallists Russia in their opening Pool A match. Claire Cashmore and Stephanie Millward fail to win a medal in the final of the women's 100m butterfly S9, finishing in eighth and fifth position respectively. They had qualified for the final by finishing second (1:13.26) and third (1:12.32) in their respective heats. GOLD MEDAL - Jonathan Fox takes gold with a time of 1:10.46 after setting a world record time of 1:09.86 in his men's 100m backstroke S7 heat to ease through to the final. Sean Fraser finishes sixth in the men's 100m Butterfbly S8 final in a time of 1:05.99, having earlier qualified for the final as one of the fastest losers. Meanwhile, Oliver Hynd finishes fourth in his heat in a time of 1:07.82 but misses out on qualification. SILVER MEDAL - Nyree Kindred wins silver in the final of the S6 100m backstroke final with a time of 1:26.23 being pipped to gold by Lu Dong of China who set a new world record of 1:24.71. Harriet Lee finishes seventh in the final of the women's 200m individual medley SM10, despite earlier swimming a personal best of 2:38.06 in her heat, while Gemma Almond finishes a place below in eighth. Susie Rodgers, who won five gold medals at last year's European Championships, finishes sixth in the final of the women's 100m backstroke S7. SILVER MEDAL - Hannah Russell wins silver in the women's 400m freestyle S12 with a time of 4:38.60. She reached the final after finishing in first place in her heat in a British Paralympic record time of 4:41.25. Anthony Stephens, who won bronze at the Athens Olympics in 2004, and 15-year-old Andrew Mullen, finish eighth and sixth respectively in the final of the men's 50m freestyle S5. Rob Welbourn and Jack Bridge miss out on reaching the final of the men's 200m individual medley SM10, finishing fifth (2:19.80) and sixth (2:21.35) in their heat. Aaron McKibbin loses both of his group B preliminaries 0-3 to Churen Sun of China and 2-3 to Belgium's Mathieu Loicq in the men's singles class 8 and is eliminated. Sara Head wins her first game in the women's singles class 3 defeating Hyun Ja Choi of Japan 3-2. She faces Italy's Michela Brunelli on Friday. David Wetherill defeats Italy's Raimondo Alecci in five sets in his first group game of the men's singles class 6. Sue Gilroy wins her first women's singles class 4 preliminary convincingly with a 3-0 win over Fadia Ahmed of Egypt across three games. She next faces Republic of Korea's Sun Hye Moon on Friday. Victoria Bromley suffers a dissapointing defeat against Anzhelika Kosacheva of Russia in the women's singles class 11. Scott Robertson adds to Britain's struggles in the ExCel as he loses out to Ningning Cao of China 3-1. William Bayley wins his men's singles class 7 match over Yuttana Namsaga of Thailand with a score of 3-0. ParalympicsGB women, who finished eighth at the Beijing Olympics, lose their opening group A game against the Netherlands 62-35. Meanwhile the men lose narrowly to Germany, 72-77.